When I say goal setting I don’t want students to think, “My goal is to get an A by the end of the quarter.” The goal is to reach a level of proficiency on a learning standard. And when I say progress monitoring I don’t mean the students should only check their grades on-line. It means the students chart their progress and reflect on what needs to be done to demonstrate proficiency. These ten minutes of class may be the most empowering time for my sixth graders because it is their time to reflect on their progress. Plus, by shifting the focus from grades to learning the students have put the horse in front of the cart. Granted it has taken some time, but they know the conversation in my classroom is about learning. I’ve only been doing goal setting and progress monitoring since the start of the year (along with Standards Based Grading), so I would love your feedback on what works for you. In my classes, students set goals using Marzano’s 4 point proficiency scale knowing that 3 is the target. Every time students complete a formative assessment, they monitor their progress using a version of this Student Goal Setting 7NS1 document. They keep their goal setting sheets in a three prong folder at school. Students completed the first section after the pre-test. The second and third sections were completed after each formative. What I like about the scale is how it’s not connected to a grade. I know that eventually I need to issue a grade, but the focus remains on learning until I need to convert it. As far as results? When converted to grades zero students in my four math classes earned lower than a 75% in the first quarter. The real test will be this winter and spring when students take the Measures of Academic Progress (MAP) test. I know it’s not solely due to goal setting. Formative assessments and standards based grading are other variables that enter into the equation. Hattie’s and Marzano’s research convinced me to try it. My experience thus far has convinced me to continue. I’m interested in learning how others are implementing goal setting and progress monitoring. Please share your experience. 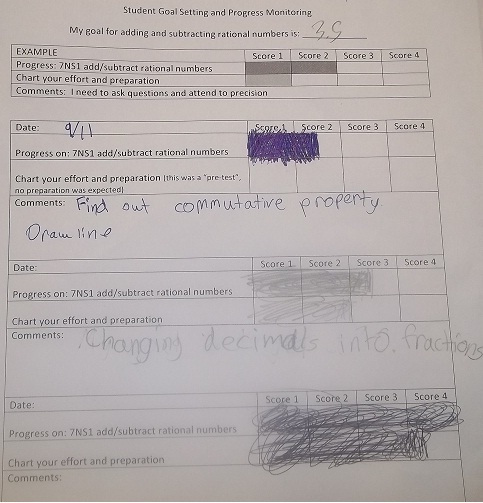 I am struggling with how to have middle schoolers keep track of their own progress. I don’t have reliable access to technology, or I’d make them all their own Google spreadsheet. Having a binder for each kid in multiple classes isn’t realistic, nor is a 3-pronged folder (I’d have to buy them all). I’ve thought about putting charts in plastic sleeves and having one binder per class, but I can’t see a non-time-consuming way to get everyone their stuff and then get it all back again. I’m glad you found something that works, and it’s really nice to see students taking some responsibility for their learning. In elementary school each kid in my class had a binder with sections for each subject. What I like about what you’ve done is that there’s a space for comments for each thing they’ll be tested on. I hope it makes them think about it and how they will reach proficiency. Actually I created a spreadsheet template–even to the point with students having their own file, with cells hotlinked to a master file that I monitor. But I went the pencil/paper route because creating the line or bar chart in Excel was so quick I really didn’t think kids would reflect. I thought the simple act of taking the time to physically shade in a bar chart forces them to think about their progress. I also thought about having kids keep their sheets in the math section of their binder, but many of them are disorganized. Would using manilla folders work for your students and collect them by tables or rows for easy distribution and collection? This is my first time with goal-setting and progress monitoring and I’ve learn I’m the only teacher in my building doing it. I really think we should be having our students assume ownership and take responsibility. I wish I started this years ago! Do you know if this is more common place at the elementary level?